Can Steve Bloom, or anybody please give me a few examples of where I am “..posting pure fabrications as “science.”.. “. http://www.warwickhughes.com/cool/cool13.htm conflates two data assets using different sea ice metrics and neglects to inform the readers that this has been done. http://www.warwickhughes.com/cool/cool10.htm includes, among other things, a discussion of average temperature in Alaska that neglects to correct for the geographic location of the weather stations (i.e., as a casual glance at the map shows, heavily biased toward southern areas that have not experienced sharp recent warming). There is also a long discussion that ascribes all of the temperature increase in Fairbanks to the urban heat island effect (UHI), but even taking this analusis of a single location at face value it has the problem of not accounting for the substantial observed permafrost melt that has been thoroughly documented in rural areas. See http://www.arctic.noaa.gov/essay_romanovsky.html for a good overview with references. There is also the problem of the Alaska-wide observed melting of glaciers (with the exception of a few that are growing due to increased precipitation). These were both written by guest author Willis Eschenbach, so perhaps you should be a bit more careful with the editing process. Your own climate stuff seems to be pretty much focused on the UHI. The references to this are so extensive I’m unlikely to read through them all carefully enough to do a serious critique (nor am I really qualified to do so), but offhand it appears you spend an awful lot of time criticising work by Jones from the ’80s and ’90s when what you ought to be concerned with are the current data sets. Oddly, you fail to mention the 2001 Jones update discussed by the TAR at http://www.grida.no/climate/ipcc_tar/wg1/052.htm#221, which leads me to conclude that your analysis is likely an incomplete update of a prior critique of the SAR and so not very useful, especially as the TAR itself is nearly history. ‘In this he claimed that his analysis showing the similarity of warming trends on windy nights compared with calm nights means that urban warming is not significantly present in global temperature data. ‘This conclusion is becoming much quoted by those believing in the integrity of IPCC Global Warming datsets. I emailed DEP and asked him for his station list. It turned out to be the GCOS data which is vastly more rural than the Jones et al data used to compile IPCC Global Warming trends. You then list the Australian stations used by Parker, from which I count 5 urban, 4 suburban and 8 rural. Given Parker’s limited purpose, there was no reason for him to use all stations, but rather just a reasonable sampling. If the list you provided is any indication, that’s exactly what he did. Also regarding the UHI, I see no reference in any of your discussion to Peterson (JClim 2003), http://ams.allenpress.com/amsonline/?request=get-document&doi=10.1175%2F1520-0442(2003)016%3C2941:AOUVRI%3E2.0.CO%3B2 , which provides considerable support for Parker’s conclusions. Why not? If you’re going to keep material like this UHI stuff on your site, either keep it up to date or clearly label it as in need of updating. Re #104 (BH): http://www.someareboojums.org/blog/?p=7 is a good start. If you google his name you’ll find that he’s more lately gone into the business of predicting an imminent ice age. I was hoping that you would bring forward a peer reviewed article which addressed some of the issues which conerned Jawarowksi. I still have not seen an article which discusses the contamination issue which Jawarowski brought up. I have spent much of the past 25 years dealing with trace gas analysis and contamination issues. Analyzing gases which are also present in the atmosphere is very difficult because of sample contamination. Re #106 (BH): You’re kind of asking me to prove a negative. J. would first have to get his ideas published in such a journal for anyone to bother replying, and so far he hasn’t. I think it’s a fair bet that he never will given how long he’s been trying. Also, I think you already got an answer on this general point in comment 36. Hopefully Eric will still be able to collect those references, although if you’ve been dealing with related issues for so long I would think you’d be able to find them too. OTOH maybe the ice stuff is more specialized. The Antarctic core data shows that during the cooling part of a CO2 cycle the drop in CO2 is progressive but highly spiked, whereas during the warming part of the cycle CO2 increases exponentially from the CO2 turnaround. The curve therefore exhibits a pronounced temporal and geometric asymmetry. Is there an obvious reason for this? Presumably atmospheric CO2 is lost by solution to ocean waters during the cooling cycle – and vice versa during the warming part of the cycle. In the case of the CO2 downturn, it can be imagined that the increase in insolation resulting from changes in the orbital eccentricity, along with other negative feedback factors (clouds), must at some point overtake the positive feedback of the CO2 decrease. But what explains the temporal asymmetry and steepness of the increasing-CO2 part of the cycle? I am also hoping that Eric can find some of the journals that he mentioned above. I can not find a request in my brief post (106) for anyone to prove a negative. My professional experince has been in the area of gas analysis. One of the major problems that I have seen is the use of very sophisticated analytical equipment combinged with poor sampling techniques. The result all to often is that the analyst does a very good job measuring the trace gases in the sampling system rather than in the sample. I do not have sufficient information to know whether this problem is occuring in ice core gas sampling. This is why I am asking for more information on ice core sample handling and storage. Re 108 – If there were “an obvious reason”, someone would have come up with it by now! But here is a pronouncement that can point to the answer. There are several factors, which interact to produce the climate SYSTEM. When they cooperate, then there is a smooth transition. When they compete, there is a spiked output. The factors are solar flux (modified by Milankovitch and other? cycles), greenhouse gases (via water vapour, carbon dioxide and methane,) and clouds, ice and other albedo affecting processes. That more or less sums it up, but note that clouds are in two teams; greenhouse effect and albedo, and the greenhouse gases have various sources and various sinks. Hansen said that the reason why during warming periods the action is rapid is because it is a wet time. In other words, the surface of the melting ice sheets is wet and the greenhouse gas water vapour is increased. Moreover, their albedo decreases and the warming means that the oceans give off more CO2. As the permafrost retreats more methane is release from the exposed peat, and it is also produced by the tropical jungles where increased temperatures lead to greater precipitation and more decomposition that is anoxic. Explaining rapid deglaciation is easy, but explaining spikey glaciation is more difficult. However, here is a scenario. The ice sheets expand, and this causes a drying over the land because the vapour pressure of ice is less than wet soil. So both the lack of water vapour and the increase in albedo cooperate to cause cooling. But the movement of the ice sheets out of the tundra into the taiga means that the sink for CO2 produced by growing trees has been reduced. That requires a large landmass to be effective, which does not exist in the SH. So I think that the spikes you see in Vostok cores are caused by the SH and NH competing. The spikes in the Greenland cores are cause by the lands and oceans competing in the NH. Re your 101 and 103, I do not think “Adulterated fabrication” is any improvement on “pure fabrication”. I fail to understand why you can not address the science issues on my site without making sweeping derogatory comments that might constitute libel. Thanks for your specific instances Steve which I will reply to on my own Blog where I hope we keep to matters bearing on science not personalities. Re #109 (BH): Why don’t you just email the relevant researchers and ask them for their protocols? Having said that, of course the problem with inquiring about this sort of thing from a distance is that written lab protocols don’t necessarily reflect actual practice. Short of wrangling an invitation to watch them work on the samples, your doubts may have to remain. OTOH there are some rather large numbers of extremely qualified people working on those cores, and absent some evidence to the contrary it seems unlikely that there is a problem. Re #111 (WH): Just so there’s no misunderstanding, what I mean by “adulterated fabrication” is that many of the articles on your site contain assertions that are simply made up or based on patently false premises. If you like, I can provide more examples (on your site, not here) after you’ve responded to the ones I listed. I’ll check your blog periodically for your response. Finally, FYI, libel law here in the US (where I live and where this site is hosted) provides no basis for an action based on the comment I made. Possibly the law is different in Oz. Re 112 Another point that should be considered is that the CO2 record may reflect the temperature trends better than the D isosope record that is currently used. The D-record depends on the rates of evaporation and condensation of water which could alter, for instance if the oceans currents switched in the Southern Hemisphere when global temperature exceeds a threshold. Alastair, the deuterium temperature proxy indeed has its problems, but is recently corrected by another method (see Jouzel ea. 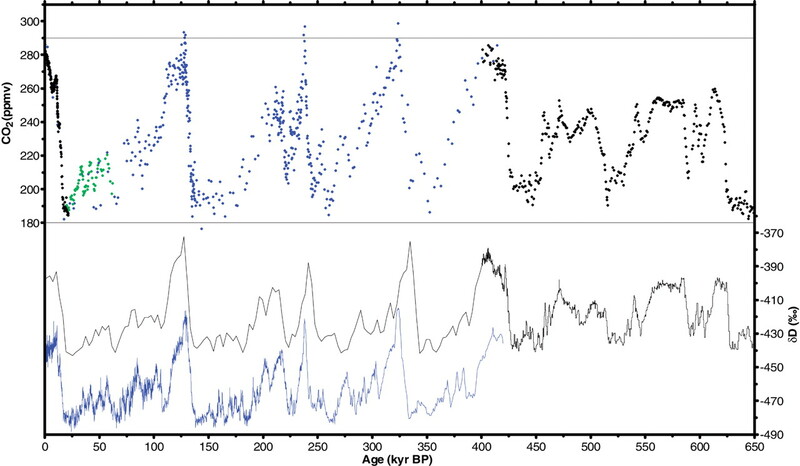 ), which shows a smaller amplitude and a more S-shaped signal during the onset of the last glaciation, but the timing of the events – and the lag of CO2 – didn’t change at all. Moreover, the methane data follow far more closely the temperature data. Remains to be seen if the observations are reproduced in the Dome C / Epica project. Re 115 Thanks for that reference Ferdi. It tends to agree with my idea that tempertures stayed higher longer and tended to be a closer match to the CO2 record, but they are not really the same even allowing for a lag. I was just checking that idea using the figure at the top of this thread and I noticed something strange. It looks as though if you added the CH4 curve to the delta D curve you would get a shape that was similar to the CO2 curve. Not what I would expect, which is that the sum of the CH4 and CO2, each with suitable loadings, would give the delta D curve. Can you see that too? 1. Regarding the claim that I only referenced southern stations, this is untrue. I refer the interested reader to the graph entitled “Alaska Temperatures – All First Order Stations” (which means exactly that), the referenced cited data from which the graph was developed, and the surrounding discussion. 2. Regarding the claim that I ascribe “all of the temperature increase in Fairbanks to the urban heat island effect (UHI)”, I nowhere make that claim. I do provide a graph showing the difference between the Fairbanks Airport record and the Fairbanks record, which will allow the interested reader to see the amount of UHI each year. I also provide a graph of two other, independent datasets that verify what the first graph showed, that Fairbanks cooled from 1976-2000. Thus, I’m mystified by your referring to “all of the temperature increase in Fairbanks”, when the data, both with and without the UHI, show that Fairbanks has been cooling since 1976. I repeat, even the data with UHI shows cooling since 1976. 3. Regarding the claim that I ignored the “substantial observed permafrost melt”, I did not ignore it or deal with it at all. Short term, since Alaska temperatures have been roughly steady sincy 1976, the permafrost melt must the result of the 2-3°F PDO driven temperature jump in 1976. Longer term, the arctic warming since the 1960s has contributed to the current melt. Longer term yet, the Arctic was warmer in the 1930s than it is now, and compared to 1935, permafrost has increased. The most rapid warming in the Arctic occurred from about 1915-1935, and during that time permafrost melted. 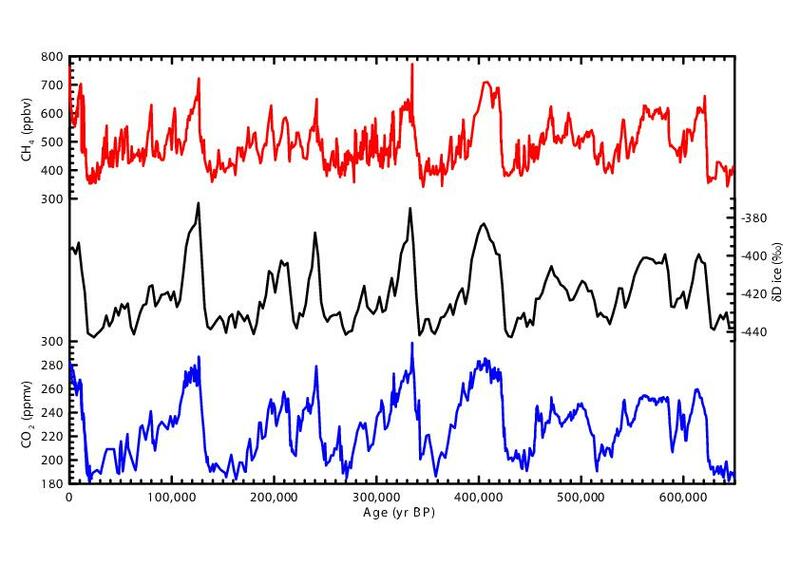 And in terms of the Holocene (10,000 year interglacial), ice core records from Greenland show that we have been cooling for the last 10,000 years, and thus permafrost overall has been increasing. I’m not clear what mentioning all of this melting and freezing of permafrost does, but you seemed to think it was important that I deal with that. Let me be clear here. Alaska is currently warmer than in 1970, and cooler than in 1930. When the PDO caused the temperature to jump 2-3° in 1976, a slow melting ensued, which has continued to this day. However, in contrast to claims of rising CO2 driving a “Polar amplfication” of temperature, Alaskan temperatures have not risen since then. Why must you reply to posts in such a mean-spirited and condescending manner? I am not disputing the accuracy of what you have said, but the attitude and mindset that you project leads me to not want to put much faith in what you say. I have followed both sides of the global warming argument and I have begun to wonder why so many on the pro-warming side react so visciously to information provided by the sceptics. By the way, why do we say there is “global” warming when the last few years here in the Southeast have been anything but warm? If it’s not warming here, then it’s not global. I always love when journalists and scientists are confronted with evidence they cannot refute — but proceed to refute it by stating its utter truth makes it moot. This is Mark Twain territory, ie. we now have irrefutable evidence the Atlantic right whale is near extinction and there is little hope the few remaining pregnant mothers and calves can be saved from ship strikes, so therefore it doesn’t matter if ships kill the rest of them. Scientists fall for this fallacy far too often. I think Zeno recited this as a parlor trick just to catch lazy scientists and logicians off guard. Specialization is ignorance. Scientists must be acutely aware of this. Scientists are today like the dog that always chased the car, then caught it. They crave respectability for their work, but are curiously indecisive when their work finally gets attention. For the first time in 2500 years, scientists now have the podium and when they get it, they run from it like scared ants. If a scientist concedes that climate change may increase sea level by many meters in a century, and accepts that anthropogenic effects are part of the cause, it is patently stupid for the same scientist to say that “it’s too late” to do anything about it now and we should just move on (presumably to higher ground). If scientists adopted this belief in 1900, there would be no wild turkey left in the USA (there are plenty today, thanks to restoration efforts.) And there would still be lots of passenger pigeons in the USA today (they went extinct in the 1930s only because everybody stopped conserving and protecting the few passenger pigeons left alive). Any competent scientist must understand the power, illogic and sway of self-fulfilling prophesy — and resist it. A responsible and thorough review of scientific history shows the true scientific visionaries have always combined empirical insight with an equally strong humanistic and compassionate outlook. This makes sense because science is always a study of what it is to be human, since humans are doing the studying. Any scientist can say that a 10 m increase in sea level in the Indian Ocean would wreak havoc on the coastal people of Bangladesh and the biota they depend upon. A true scientist would actually care about these people and not write them off. Like continents, scientists have drifted far from their moorings in the past 60 years. It’s no wonder that many young people have little interest in science. When scientists are so detached from the rigors of life that they blithely dismiss the death of millions of people as “that’s the way it goes” it is no wonder young children recoil from science and seek meaning in non-scientific outlooks and become scientifically illiterate as a result. The scientific method is an innately human construct and cannot diverge from a basic humanist focus if it is to survive. If people feel science has become inherently hostile to their own survival, they will dismiss it based on purely Darwinian principles. Once scientists employ the scientific method only to enhance their personal prestige or economic standing they cease to be scientists. De 119 Thanks Ferdi. You meant Eemian not Eocene of course! I may try playing around with them myself soon.